This luxurious 4-Star hotel is situated at 3 Stadium Road, Rumuomasi, Port Harcourt, a mere 20-minute drive from Port Harcourt International Airport. Novotel Port Harcourt is strategically positioned for the convenience of business and leisure travellers. Guests wouldn't just benefit from its positioning but also the exquisite comfort, curated care and experience needed for an amazing stay in the city of Port Harcourt. 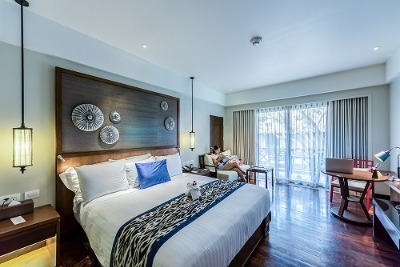 Every room is fitted with a king-sized bed, a refrigerator, an air conditioner, cable connected TV, intercom, tea/coffee making machine, minibar and private bathroom. Novotel Port Harcourt offers facilities such as: a well-equipped gym, outdoor swimming pool with sun beds, and children play area. Free Wi-Fi access is available throughout the premises. A business centre is also available onsite.The restaurant serves a wide range of local, French and other international cuisines that can be enjoyed on the terrace. The bar is well-stocked with a wide range of alcoholic and non-alcoholic drinks. Novotel Port Harcourt meeting/banquet facilities suitable for conferences and leisure events. Additional services available for the convenience of guests include: 24-hour front desk, concierge service, room service, safety deposit boxes, laundry service, car hire, airport shuttle, and housekeeping. Ample parking space is available. Children: Kids are welcome to stay at no extra cost. Q: Does Novotel Port Harcourt offer free Wi-Fi? Q: Does Novotel Port Harcourt have a swimming pool? Q: Does Novotel Port Harcourt offer complimentary breakfast? Q: Is there a fitness centre/gym at Novotel Port Harcourt? Q: Does Novotel Port Harcourt have a restaurant? Q: Does Novotel Port Harcourt have onsite parking? Is it free? A: Yes, on-site parking is free/available. Q: Does Novotel Port Harcourt offer airport pickup or shuttle services? A: Yes, airport shuttle services are available at extra charge. Q: Does Novotel Port Harcourt have an event centre/conference rooms? A: Yes, conference rooms are available. Q: Does Novotel Port Harcourt allow pets? A: Only service pets are allowed. Q: Does Novotel Port Harcourt have cribs? A: Yes, cribs are available. Novotel Port Harcourt is a top-class hotel in Port Harcourt, Rivers. My stay at Novotel Port Harcourt was so awesome. It was very perfect with all the necessary facilities. There was maximum security, excellent customer service, lovely hotel attendants and the meal was very tasty. This is just the place to be. It's such a beautiful place with beautiful rooms and facilities. My room was spacious and comfortable. Power supply was uninterrupted throughout my stay. Breakfast was very delicious and nutritious. I was treated very well, I must confess. On my next visit to Port Harcourt, I will lodge here. I had a nice stay at the hotel. It was very close to where I was going to the following morning so I just decided to pass the night at the hotel. It was a very serene and conducive place, although the Air conditioning unit in my room was not functioning well which made me a little uncomfortable till about mid night. This is the first time I am visiting Novotel hotel and I am impressed with their services. The hotel is a very lovely place, the staff are really professional and effective. The rooms are beautiful and it has nice curtains. The bathroom is neat and has the necessary toiletries. Their food was also affordable and tasty, I will definitely use this hotel again. I had a fantastic stay at the hotel, everything was just perfect. I was given a warm reception, the staff were friendly and respectful. The hotel was just renovated and it was very neat and comfortable, I had sockets in the room for me to charge my phones and customer service was prompt and efficient. My room was spacious and neat, the bathroom also had all the necessary toiletries. The environment is serene and clam also, I had pleasant stay and am impressed. Have nice pictures of Novotel Port Harcourt?